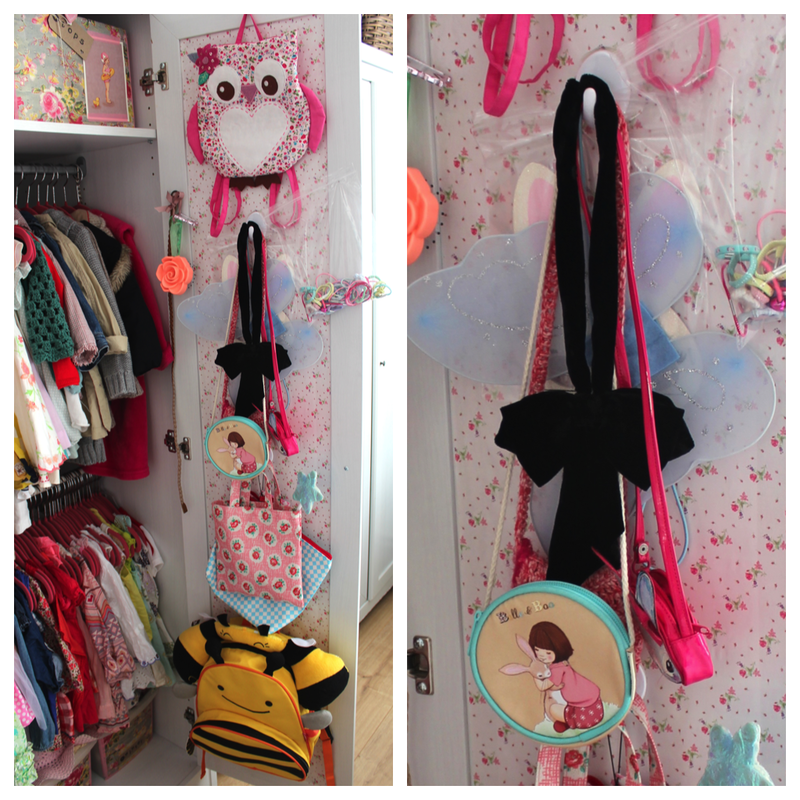 B U B B L E G A R M: MUMMY LIFE - Toddler Wardrobe Storage! MUMMY LIFE - Toddler Wardrobe Storage! 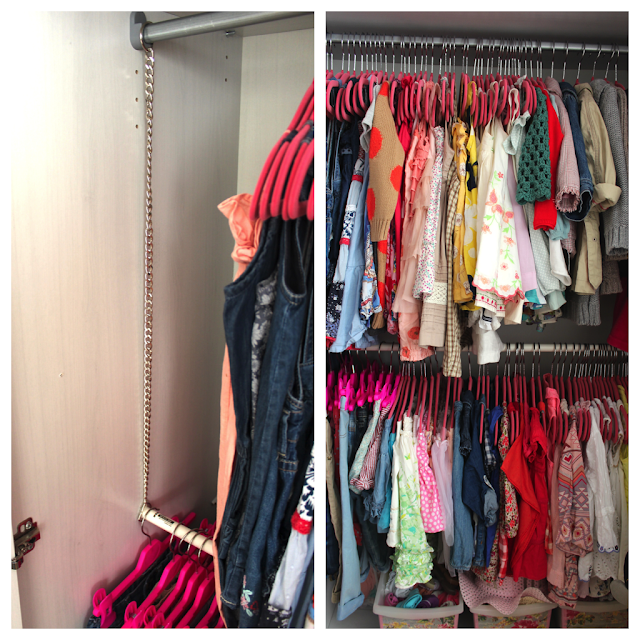 As she's growing her clothes are getting bigger and bigger and having just the one rail and lots of boxes under it wasn't suiting me anymore, it was beginning to turn into a mess so operation reorganisation began and I love the end result. I have been using it like this for a couple of weeks now but was waiting on some hangers so I could finally update. I'm going to start from top and explain my way down. I have stored her shoes up top in a box as she likes to wake up in the morning and try on all her shoes and walk around, so to prevent that they are now out of reach. 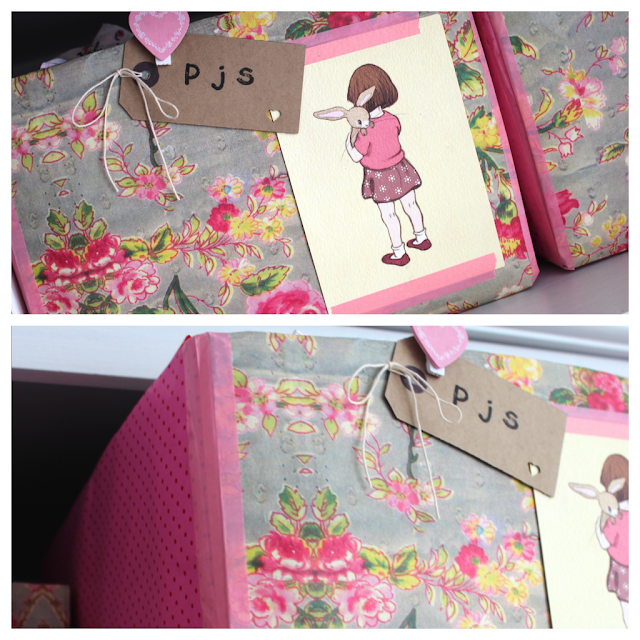 Her pyjamas and tops / t-shirts are also stored in boxes. I had been thinking about adding another rail, but the wardrobe I have (Ikea aspelund -adult size) isn't really kit out for it. So, I purchased a curtain rod, and secured it with some chains and a glue gun and it has worked out great which enables me to double hang. I had multicoloured plastic hangers before and they drove me mad, as the colours always got in a muddle. 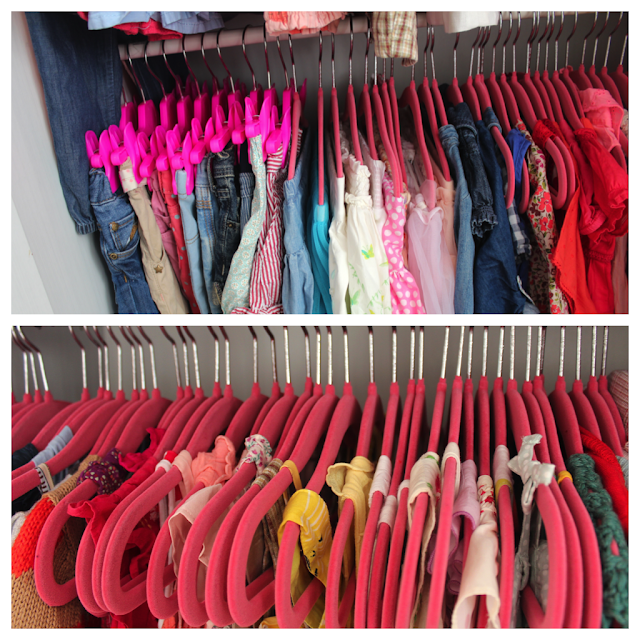 I purchased the JVL pink velvet hangers, and now none of her clothes slide off which is perfect. I also purchased some pink clip trouser hangers from 'hangerworld' which didn't look that bright on the online picture but it does the job. Luckily her skirts are small enough to fit around the normal hangers. I added pretty floral paper on the inside of the cupboards, just because. Her handbands are still in clear plastic pockets which I fixed with double sided tape and selotape, but this time I used bigger pockets and organised them by colour instead of putting each one individually which is quicker when in a rush. Her clips are also attached onto little brown tags which I secured with washi tape. I added hooks on the inside of the cupboards so that I could hang her accessories on. It's so important to make the most of every space, really don't forget to make use of the inside of your cupboard doors. I hope that some of my organisation techniques can help you and inspire you to do a little organising. How do you store your clothes? My wardrobe is still a work in progress, but I have started on that mission again too! It's so pretty and girly:) I actually follow your Pinterest board on organising, and you've definitely been an inspiration for my little girl's wardrobe! I hate mess. Haha. I wrote a post on it too. Everything looks so cute and very well organized! You are the queen of space optimization and organization! Everything looks so pretty- love that owl! I love covering boxes with fabrics and papers too, way cheaper than buying decorative boxes in the store! I love how beautiful you've made it - from the wrapping paper to the tags and the heart pins and postcards...you could easily be a cath kidston-type designer/decorater! It is awesome!!! I like it. It is designer and beautiful with space. This is lovely. Babies always end up with tons of clothes cause they grow so quickly. 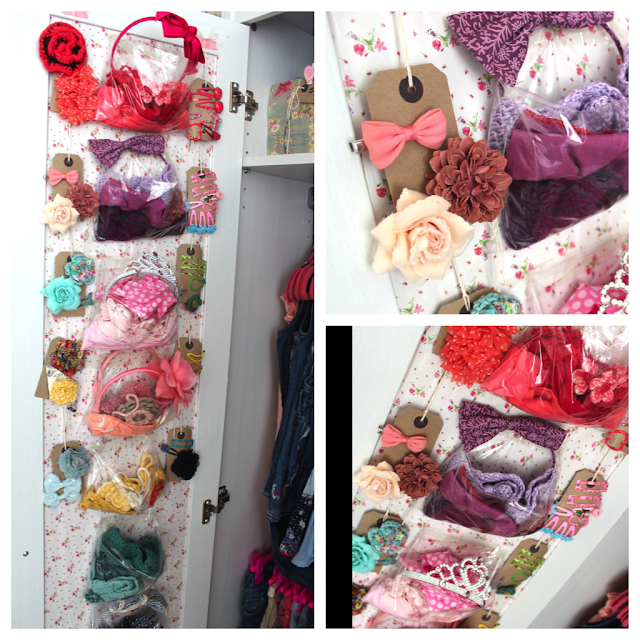 This is the cutest wardrobe ive ever seen for a little girl, its so pretty! Wow! The wardrobe is so well organized. It looks great and there is a lot of stuff stored in your available space. Wow! That wardrobe is so well organized now. It looks good, and you've managed to store a lot of items in your available space. I am so impressed that those are just boxes, covered in pretty paper. Inspired! Love your post! So interesting! You gave me an idea with the "make the most out of your wardrobe", so thank you! You are so unbelievably creative, you have created such a gorgeous space!! You truly have a gift and a talent for being creative and finding ways to make a small space work with maximum efficiency! I'm awed and inspired! Very organised! I like it.